Congratulations to the winners of the American Journal’s Best of Best Readers Choice Contest! We asked our readers to tell us their favorite stores, services and restaurants in Westbrook, Gorham and Buxton and the results are in! Thank you to all readers who took the time to vote. To mark the occasion, all of the company owners and employees are invited to celebrate the winners at a special reception, from 5-7 p.m. Thursday, November 15, at Brea Lu Cafe, 9 Cumberland Street, Westbrook. We hope you’ll come mingle with the area’s Best of Best. Founded in 2006, Blake Hurley McCallum & Conley is a local accounting firm specializing in small business accounting, auditing and tax services. They offer a range of services for individuals and businesses, from tax return preparation and tax planning to audit services and consulting, for all aspects of your business. Meet the staff at bhmccpa.com. Sally-Alane Fox’s professional background as a certified public accountant includes work in the retail grocery industry, tax services for a variety of clients while at Ernst & Whinney, and managing Keirstead & Fox with her partner, Dwight Keirstead. Upon his retirement, she and her staff joined The Swanson Group where they continue to work with various small businesses, non-profit organizations and individuals to meet their clients’ tax and accounting needs. Visit yourmainecpa.com. A certified public accountant since 2000, Kyle Currier provides tax preparation and tax planning services for individuals and small businesses in southern Maine. Her services include tax planning and preparation for individuals, partnerships, limited liability companies, corporations, nonprofits and trusts. Additional specialties consist of financial statement preparation, business and strategic planning, as well as compilation services. Read more at gorhamcpa.com. The amenities at this Cinemagic Theater include all-digital presentation, assisted listening devices, all-stadium seating, wheelchair accessibility and ticketing kiosks. They offer birthday party packages for up to 10 party guests plus one chaperone. Military personnel qualify for a discount with proper identification. Purchase tickets online at cinemagicmovies.com or at the theater box office. The theater opens one-half hour before the first show, and closes at 10 p.m.
Joker’s Family Fun & Games is a safe, fun-filled activity center where the whole family can have fun together. In a wide-open, safe, climate-controlled environment, play for hours in the Amazing Playhouse, amuse yourself with video games, win prizes and have homemade pizza, or enjoy a memorable birthday party – all for a very reasonable price. Open Wednesday-Saturday 10:30 a.m.-8:30 p.m., Sunday 10:30 a.m.-6:30 p.m.
First opening in 1953, Prides Corner Drive-In is known for a wide selection of movies and tasty refreshments at the snack bar. The sound transmits through your car radio set to 88.9 FM. The admission price is $20 per carload, with a maximum of 4 persons; $5 for each additional person. Cash only is accepted at the box office and snack bar. Gates open by 6:30 p.m.
Continuum for Creativity provides space and time for exploring and creating art, music and the written word. The gallery is a venue for teaching and learning, exhibiting, performing, writing, reading, meetings, parties and other community arts events. Continuum is available to rent for your workshop, performance or meeting. Additionally, proprietor Mary Brooking accepts commissioned work and teaches acrylic painting at her arts space. See marybrooking.com. Bill Dodge Auto Group has been a Maine family-owned and -operated company since 1970. New car brands include GMC, Buick, Cadillac, Kia, BMW, Infiniti, Nissan and Hyundai. They also have a Used Car Super Center. Priding themselves on customer satisfaction, they provide a customer rewards program. Search their inventory at billdodgeautogroup.com. Recipient of Ford Motor Company’s 2017 President’s Award, Rowe Ford Westbrook offers a variety of services to area drivers, including sales, finance and repair. There, you can buy or lease new Ford models such as a Fusion, Focus, Fiesta, Escape, Taurus, Explorer, F-150, and Mustang. Are you in the market for a used car? Their team will be happy to fill you in on each of the options in their inventory. Lee Dodge Chrysler Jeep Ram Westbrook is part of the Lee Auto Mall family of automotive dealerships. They are a high-volume Chrysler dealer, with a large selection of new and pre-owned Dodge, Chrysler, Jeep and Ram vehicles. They have two modern showrooms. Their main showroom features a selection of Chrysler, Dodge and Jeep vehicles. Their Lee Ram Truck Center, unique in all of New England, is 100 percent dedicated to Ram Trucks. At 207 Motors, they choose their inventory to provide customers with quality vehicles. Cars and trucks are sent to their service center and have all necessary maintenance done before they are offered for sale. Their sales staff does not receive a commission on vehicle sales to give their customers a pressure-free experience. Conduct an online inventory search at 207motors.com. Open Tuesday-Saturday 9 a.m.-5 p.m. Founded in 1996, Carter’s Auto Service is a small, friendly, family-run business. They are continuously updating their equipment so that owner Doug “Kip” Carter and his knowledgeable staff of technicians have the very latest in tools and technology. This enables them to fix your vehicle quickly and efficiently, including hybrids. They use quality parts from NAPA, Moog, Monroe and Wagner, and also offer most major tire brands. As a full service auto repair facility, the technicians at Sullivan Tire can fix brakes and transmissions, perform diagnostics and state inspections, provide preventive maintenance and more. They also stock thousands of tires. Free amenities include high speed WiFi, local courtesy shuttle, hot beverages and after-hours key drop. Hours of operation are Monday-Friday 7:30 a.m.-6 p.m., Saturday 7:30 p.m.-5 p.m. Established in 2016, Bulldog Auto specializes in automotive repair. With more than 20 years of combined experience, business owners Andy and Patrick Dufresne have gained many skills and expertise to meet all your vehicle repair needs. Walk-ins are welcome, no appointment needed. This NAPA AutoCare Center is open Monday-Friday 8 a.m.-5 p.m. Celebrating their 150th anniversary, the people at Gorham Savings Bank believe you deserve more than a big bank with a short attention span. Staff members keep their decision-making local with the goal of meeting your needs. Lobby hours are Monday-Thursday 8:30 a.m.-4 p.m., Friday 8:30 a.m.-5 p.m., Saturday 8:30 a.m.-noon. As Maine’s first credit union, Infinity Federal Credit Union has been serving its members since 1921. Infinity FCU provides financial products and services designed to put the member in a better financial position with products at highly competitive rates and efficient, personalized service. This branch has a drive-up ATM, two drive-up teller lanes, and a night depository box. The lobby is open Monday-Friday 9 a.m.-5 p.m., Saturday 9 a.m.-noon. Each person has a unique plan for what they want to accomplish financially. Norway Savings Bank professionals want to help you shape yours. To get going, check out their advice at norwaysavings.bank, then meet with a Norway expert at your nearest local branch. Lobby and drive-up hours: Monday-Thursday 8:30 a.m.-4 p.m., Friday 8:30 a.m.-5 p.m., and Saturday 8:30 a.m.-noon. Brea Lu Cafe is open for breakfast and lunch daily. Their extensive menu contains a huge hungry-man pancake, corned beef hash with poached eggs, veggie sausage omelet, home fries, a classic Benedict and many more selections. Convenient parking is available. Open daily, 7 a.m.-2 p.m.
A full-service restaurant, The Blue Pig Diner serves barbecue, breakfast and brunch. Menu entrees include egg sandwiches, house-smoked pulled-pork hash, BBQ burrito and stuffed French toast panini. Their full bar features signature mimosas, Bloody Marys, draft beer and more. Restaurant hours are Monday and Tuesday 8 a.m.-1:30 p.m., Thursday-Sunday 7 a.m.-1:30 p.m. Locally owned and operated, Mister Bagel serves guests a hearty breakfast, complete with breakfast bagels, French toast and other wonderfully morning-time favorites in a relaxing and comfortable atmosphere. They also serve lunch and offer catering for special events. Open daily for breakfast and lunch. Established in 1976, Guidi’s Diner offers an extensive breakfast menu including some fun locally named omelets and specials. Highlights are their home fries with sauteed onions, humongous pancakes, and a bottomless cup of coffee. The staff is friendly and welcoming to regulars and newcomers alike. The diner is open daily, 6 a.m.-1 p.m. The facility at Toddle Inn Westbrook features small group sizes, a state-of-the-art playground and an onsite indoor heated pool operated by Safety Educators of Maine for year-round swimming lessons. Contact manager Raelene Bodman for tuition rates and sibling discounts or to schedule a tour. Learn more at toddleinn.com. Established in 2000, The Little Red School House is a licensed and certified day care center. Their friendly staff provides a fun, safe, nurturing and educational atmosphere for your children. The programs at The Little Red School House incorporate many preschool aspects into the daily routine, such as color, letter and number recognition; music and movement; adventure walks; and following directions. For additional details, go to the-little-red-school-house.com. Before and After the Bell is held at Little Falls Activity Center on Acorn Street for students in grades K-5 attending Great Falls, Narragansett and Village Schools. During program hours, participants will have the opportunity to have a snack, do homework and enjoy activities such as active games, free time, board games, arts and crafts and outdoor time. Refer to gorhamrec.com for more information. Let the Mister Bagel Westbrook and Gorham stores cater your next event. Create your own platter or order from their breakfast and lunch menus. They prefer 24-hour notice but can often accommodate last minute orders during the hours they are open: Monday-Friday 6 a.m.-2 p.m., Saturday and Sunday 7 a.m.-1 p.m. The Gorham store closes at noon on Sunday. Having founded the company in 1996, Josh Gelston, owner of Starlite Catering, primarily caters concerts, but no party is too small to be accommodated. All menus are custom made – tailored to a client’s needs and desired price range. Some examples of popular choices are carved New York sirloin, chicken and broccoli alfredo, as well as baked stuffed haddock. Any company can give you a list of pre-made appetizers, main dishes and desserts from which to choose. Caterers at The Frog & Turtle want their fare to make your event memorable. Their chefs will work to make your food unique, favorable and hot. They don’t cook the food hours before, but rather right there on the spot. View images of their work and contact them at thefrogandturtle.com/catering. Paul and Brianna Kennedy, who began their food careers as caterers, operate their primary enterprise as a restaurant, but they still do catering as a side business. They tailor the menu for their customer’s particular function and have handled events for groups of 20 to 2,000. They can be reached during restaurant hours: Monday and Tuesday 8 a.m.-1:30 p.m., Thursday-Sunday 7 a.m.-1:30 p.m.
Dr. Robert Lavoie at Chiropractic Clinic of Gorham has been delivering natural chiropractic care to the Gorham community and the Greater Portland area since 2006. There, he and his team understand that symptoms like pain and disease stop you from living the way you want to. By locating the root of these issues, they seek to give you a complete healing experience that will allow you to enjoy lasting good health. Synaptic Chiropractic combines chiropractic care with today’s leading technological advances. Dr. Ella Coffren and her team offer brain-based programs and effective stress management for the whole family. If it’s a mom with headaches, a dad with a sub-par golf game or a child with ADD/ADHD, they make sure to address the whole patient and not just their symptoms. Read about the clinic at synapticdc.com. Founded in 2001, New England Chiropractic specializes in natural health care and provides safe, effective and gentle chiropractic adjustments for the wellness-minded family. Their patients, ranging from pediatrics to geriatrics, achieve benefits such as decreased stress, increased energy, and improved immune function. New patient forms can be accessed at newenglandchiropractic.net. Office hours are Monday-Thursday 9 a.m.-1 p.m. and 3-6 p.m.
Kohl’s department store is stocked with everything you need for yourself and your home – apparel, shoes and accessories for women, men and children, plus home products like small electrics, bedding, luggage and more. The store is open Monday-Thursday 9 a.m.-10 p.m., Friday 9 a.m.-11 p.m., Saturday 8 a.m.-11 p.m., and Sunday 9 a.m.-9 p.m. When you shop at your local Goodwill, you find great items and help provide job placement and training opportunities for people in your community. Whether you’re searching for unique fashion-forward finds, basic items for your family, home décor at a discount or supplies for your next do-it-yourself project, you can find what you need here. Located in the Dana Warp Mill, Catalyst For Change Wear designs premium lifestyle and fitness clothing that supports selected causes each time a purchase is made. They have selected the Maine Children’s Cancer Program and American Foundation for Suicide Prevention-Maine Chapter to receive a portion of their sale profits for one calendar year. Store hours change weekly. Check cfcwear.com/store-hours. The Daily Grind coffee house is the place to go to have breakfast or lunch with a friend, meet a client or get some work done. Enjoy the relaxing atmosphere surrounded by comfortable, repurposed decor while sipping on hot or iced java created by expert baristas. Cream horns, croissants and vegan/gluten-free cookies are but a few of their pastry offerings. Drive-thru service is available. Open Monday-Friday 6 a.m.-5 p.m., Saturday and Sunday 7 a.m.-3 p.m. Enjoy the sips and leave the fresh brewed perking and mixing to Aroma Joe’s. Having a fast paced drive-thru and greeting customers with a smile is the staff’s daily routine. The menu starts with their coffee. If coffee alone isn’t cutting it for you, why not try one of their specialty espresso drinks made from scratch, gourmet teas, hot chocolate, iced beverages or frozen drinks? Open daily, 4:30 a.m.-10 p.m.
Quill Books & Beverage is a bookstore, bar, coffee shop and community space. Their entire menu is available all day. See upcoming events listings at quillbooksandbeverage.com for details on their happenings. Hours: Sunday 9 a.m.-6 p.m., Monday and Tuesday 7 a.m.-6 p.m., Wednesday-Friday 7 a.m.-10 p.m., Saturday 9 a.m.-10 p.m.
Named after local philanthropist Cornelia Warren, Cornelia’s Closet is a resale thrift shop located at the Westbrook Community Center that sells gently-used clothing, books, housewares and furniture. Proceeds go back into Westbrook Community Center programs to help keep costs low. Current hours are Monday, Tuesday and Friday 9 a.m.-1 p.m., Tuesday 5-7 p.m., and the first Saturday of each month, 9 a.m.-noon. Goodwill stores offer a variety of items to meet your shopping needs, from clothing, shoes and accessories to household items, books and games. Each store offers a unique shopping experience. Visit goodwillnne.org. The Westbrook store is open Monday-Saturday 9 a.m.-9 p.m., Sunday 10 a.m.-7 p.m. The Gorham store is open Monday-Saturday 9 a.m.-7 p.m., Sunday 10 a.m.-7 p.m. The Vintage Heart is a quaint shop in which vintage, repurposed furniture, books, housewares, and antiques are sold. It’s a treasure trove of unique, one-of-a-kind items. Check the frequent posts on their Facebook page for new merchandise. Open Tuesday 10 a.m.-3 p.m., Wednesday-Saturday 10 a.m.-4 p.m.
An insured general contractor, Paul R. Crimmin specializes in new home construction, additions, remodeling, decks and porches, roofing and siding; plus, since we live in Maine, snowplowing. Admire photos of his work by checking out his Facebook page. Some of his recent projects include finishing off a basement, sheet rock replacement, installing flooring, kitchen and bathroom remodels, and creating a customized oak entertainment center. Since 1977, The Roofa is a family-owned roofing company offering installation and repairs for roofing, siding, decks, gutters and more. Owner Dan Wilson and his team of experts use only the best in high-quality rubber and metal materials to assure longevity. Currently, they offer architectural, rolled and rubber roofing solutions and a variety of detail-oriented masonry and carpentry services with other materials, such as vinyl and stone. With more than 30 years of building experience, Great Falls Construction is a construction management and general contracting company. Respected throughout the industry for their meticulous craftsmanship and committed customer service, Great Falls has a diverse portfolio ranging from multi-million dollar commercial projects to detailed period-style homes, historical restorations, and government subsidized housing. The founders of Sebago Brewing Company poured their first beer at their original brewpub in 1998. Their staff brews and cans their entire lineup of high-quality and creative craft beer available for purchase throughout New England. Their Gorham location offers a family dining experience, house-brewed beer and a great atmosphere. Read detailed descriptions of their beers and view their full menu at sebagobrewing.com. Mast Landing Brewing Company is Westbrook’s first brewery and tasting room. It all began in 2013 with a simple homebrew kit. After two years of experimenting with different beer varieties and recipes, the founders took their passion for brewing and drinking craft beer to the next level. In the summer of 2015, the company was officially formed. Read about their beers at mastlandingbrewing.com. Tasting room hours are Tuesday-Saturday noon-9 p.m., Sunday noon-6 p.m.
Hops & Vine Craft Beer and Wine is a family-owned retail store selling locally crafted, imported and domestic beers, as well as fine wines. From budget to boutique, they have something for everyone. Having a function? They sell kegs upon request along with hand taps or draft box rentals. Check out their events and business hours at hopsandvineme.com. Drouin Dance Center, offering excellence in Maine dance education, offers classes for all ages – their students range from age 1 through their 70s. Located in the Dana Warp Mill, the 9,000-square-foot facility has five large classrooms and a spacious waiting room. They have a variety of children, teen and adult classes, events, birthday parties, camps and activities. Meet the faculty at drouindancecenter.com. At Dance Studio of Maine, they strive to provide your children with solid technical training as well as an enjoyable and creative dance experience. They offer dance classes for all ages and for all levels of training. Their classes are limited in size and are grouped by age and ability. They specialize in tap, ballet, contemporary jazz, hip hop, tumbling, musical theater, ballet/tap combo, creative movement and Pointe. Read bios of the staff members at dancestudioofmaine.com. With classes for students ages 3 to 93, and levels from beginner through professional, faculty members at the Centre of Movement School of Performing Arts teach a wide variety of subjects in dance and theater including ballet, tap, hip-hop, ballroom, gymnastics, drumming, musical comedy, voice and more. Their classes provide the opportunity to develop sound technical skills, expand creativity and build self-confidence while gaining a true appreciation for the performing arts. At Morgan-Hill Dental Care, Dr. Ted Morgan, Dr. Kelsey Hill, and Dr. Brett Morgan offer a variety of general dentistry treatment options, specializing in sedation and cosmetic dentistry. Free whitening or free X-rays are offered with a new patient exam. They offer an in-house membership plan, designed primarily for those who don’t have insurance. Schedule an appointment online at morgandentalcare.com. At Nano Dentistry, Dr. Nano and his staff provide patients with a great experience and offer a comprehensive list of general, restorative and cosmetic dental services designed to meet the needs of the whole family. For a listing of the many procedures and services they regularly provide to their patients, go to nanoddsme.com. Office hours are Monday-Thursday 8 a.m.-5 p.m., Friday 8 a.m.-1 p.m.
Dr. Taliento, Dr. Graffam and their entire team at Maplewood Dental Arts provide comprehensive family oral health care in a comfortable and caring environment. The staff uses the latest technology in offering comprehensive dentistry to their patients including, CEREC-Same Day Crowns, dental implants and comprehensive reconstruction, 3D imaging for high-level diagnostics and digital impressions made with an intra-oral camera. Specializing in family medicine at Martin’s Point Health Care, Dr. Tin Ha-Ngoc said that he became a family doctor to provide compassionate, holistic, high quality care for his patients and their families. By listening to and partnering with his patients, he works to promote healthy lifestyles and develop tailored preventive care and treatment plans. Specializing in internal medicine at Maine Medical Partners Westbrook Internal Medicine, Dr. Stephen Hayes has been affiliated with Maine Medical Center since 1994 and Maine Medical Partners since 1995. He received his medical degree from University of Rochester School of Medicine and has been in practice for more than 20 years. Specializing in internal medicine at Maine Medical Partners Westbrook Internal Medicine, Dr. Ellis Johnson has been affiliated with Maine Medical Center and Maine Medical Partners since 2011. He received his medical degree from Tufts University School of Medicine in 2008. Gorham House encompasses a dynamic community that has become Maine’s most successful comprehensive care environment. People of all ages have learned to rely on the staff for providing a wide spectrum of innovative quality health care services. Assisted living at Gorham House has one of the only licensed, fully staffed LPN/RN 24-hour programs in the state. Schedule a tour at gorhamhouse.com. Avita of Stroudwater is a 60-unit, state-of-the-art community focusing on memory care. Apartments are situated in small neighborhoods to minimize confusion and agitation and maximize the sense of freedom and comfort. Whether assisting with dressing, medication reminders or simply accompanying a resident for a stroll in the gardens, Avita’s highly trained associates, available 24 hours a day, are always ready with a helping hand. Springbrook Center is a multi-level facility offering skilled nursing, short-stay rehabilitation, long-term care and dementia care. They offer nursing coverage 24/7 as well as physical, occupational, speech and respiratory therapy services. Springbrook has an onsite Genesis physician serving as medical director and offers a range of dining and socialization activities to ensure that their center meets the needs of every individual who walks through their door. Jack’s Thai Cuisine serves nutritious Thai cuisine that is freshly prepared using quality ingredients. Their comfortable and attractive dining room provides a relaxing atmosphere. Here you’ll find the right Thai soup to soothe both body and soul, exotic salads that are bursting with flavor and texture, and entrées that are prepared to your hot and spicy preference. Takeout is available. Hours are Monday-Friday 11 a.m.-9 p.m., Sunday noon-9 p.m.
China Villa specializes in Szechuan and Cantonese cuisines, featuring such popular dishes as chow mein, chicken with broccoli, General Tso’s chicken and lo mein, as well as a large selection of other menu items. Their emphasis is on healthy and tasty offerings. Their dining area seats about 40 people, but many of their orders are for takeout or delivery. View their menu at chinavillamaine.com. Dine in or get takeout at Lucky Thai. On their menu, you will find a variety of well-known Thai dishes such as spring rolls, dumplings, crab rangoons, wonton soup, pad Thai, drunken noodle, lo mein, curry and duck. They also offer kid meal specials for those 12 and under. Go to lucky-thai.com for all of their menus. The restaurant is open Monday-Saturday 11 a.m.-9 p.m., Sunday 4-9 p.m.
Big Fin Poké is a casual restaurant focused on serving high-quality food. Customers can choose from rice bowls to a Pokiritto (think big sushi roll). Poké combines Hawaiian-style sushi with fresh ingredients to create a healthy alternative to the everyday fast food choices. Customers can order online at bigfinpoke.com. Restaurant hours are Monday-Friday 11 a.m.-8 p.m., Saturday noon-8 p.m., and Sunday noon-7 p.m.
A festive, family-operated Mexican bar and grill, Fajita Grill has been serving traditional dishes and margaritas since 2006. Their smoky and delicious house-made hot sauce goes great on everything. A portion of their menu lists their low-carb specials served with salad and mixture of sautéed spinach, mushroom, squash, onions, tomatoes and peppers. They’re open Monday-Thursday 11 a.m.-9 p.m., Friday 11 a.m.-10:30 p.m., Saturday and Sunday noon-9 p.m.
Custom-crafted juicy, fresh, flavorful burgers on grilled buns are the specialty of the house at Blazes Burgers, but their menu abounds with other offerings, too. Chicken sandwiches, BLTs, clam cakes, hot dogs and lots more are on the menu. Crispy tater tots coated with hot, gooey cheese is a popular side dish, along with tasty hand-cut fries and other selections. Open Tuesday-Sunday 11 a.m.-8 p.m.
Sebago Brewing offers a family dining experience, house-brewed beer and a great community feeling. Their menu provides a large variety to suit everyone’s taste including seasonal specialties, starters, salads, soups, burgers, sandwiches and a kids menu. See sebagobrewing.com. Serving Sunday-Tuesday 11 a.m.-10 p.m., Wednesday-Saturday 11 a.m.-midnight. Gorham House of Pizza is a family restaurant where Angelo and crew welcome the opportunity to serve you and make you feel like part of their family. They use only the freshest ingredients in all of their dishes, and their pizza dough is made fresh every day on site. View their menu at ghop.me. Hours are Sunday-Thursday 11 a.m.-11 p.m., Friday and Saturday 11 a.m.-midnight. The focus at Iron Will Strength Studio is one-on-one and semi-private strength training, muscle-building coaching and fat-loss nutrition programs. Their goal is for you to feel better about yourself – getting stronger, getting leaner, adding muscle, losing fat, increased physical capacity, more discipline and more self-love. Learn more at ironwillstrength.com. At Grit & Grace CrossFit, their dedicated coaches are there to keep you safe, inspire you and teach you how to move and use your body efficiently inside and outside the gym. CrossFit is a strength and conditioning regimen that combines elements of weightlifting, gymnastics and cardio to create effective and efficient workouts. Read about how you can try a workout class for free at gritandgracecrossfit.com. The staff at Planet Fitness strives to create a workout environment where everyone feels accepted and respected. That’s why they take care to make sure their club is clean and welcoming, plus their certified trainers are ready to help. Whether you’re a first-time gym user or a fitness veteran, you’ll always have a home in their Judgment Free Zone. Their hours are Monday-Thursday 4 a.m.-10 p.m., Friday 4 a.m.- 9 p.m., Saturday and Sunday 6 a.m.-7 p.m.
Harmon’s & Barton’s Florist has provided quality flowers and service since 1860. Their floral designers are uniquely qualified to enhance and set the tone for your special occasion. They will expertly arrange your bouquet of fresh flowers and can create a custom gift basket for your event. Marvel over their attractive floral arrangements at harmonsbartons.net. Their hours are Monday-Friday 8 a.m.-5:30 p.m., Saturday 8 a.m.-2 p.m. The knowledgeable staff at Broadway Gardens Greenhouses has been helping gardeners grow since 1950. Their greenhouses contain thousands of plants to choose from, northern New England’s largest selection of perennials, and hard-to-find annuals bursting with color. Their seasonal offerings include Christmas greenery. Read their long list of floral varieties at bgperennials.com. Independent and locally-owned Farmhouse Flowers specializes in floral arrangements for all occasions including weddings, funerals, birthdays, retirements and holidays. Each design is an original created for you. They also carry plants, primitive home décor, gifts and candles. Hours: Tuesday-Friday 9 a.m.-5 p.m., Saturday and Monday – open by chance. Cumberland Farms stocks packaged snacks, cold drinks, prepared foods and more, along with gas. You can pay for all of your purchases with SmartPay Check-Link, their mobile app that saves you 10-cents on every gallon of gas. Download the SmartPay app from the App Store or from Google Play. Read more at cumberlandfarms.com. Open 24/7. Under the umbrella of Holly’s LLC, which is locally owned and operated by the Leo family, Holly’s Super Gas in Westbrook is one of three full-service gas stations they own. The gas station sells regular fuel and diesel, as well as heating oil. The station is soon to be closed and redeveloped. Big Apple Stores offer many convenience products, such as gasoline, lottery, tobacco, coffee, beer, wine, soda, snacks and more. They sell Citgo gas in regular, mid-grade, premium and diesel. With the Big Apple Rewards Program, customers earn points on every fuel and in-store purchase. The store is open daily, 4 a.m.-10 p.m. Lavish Earth is filled with magical earth wonders – many varieties of crystals and minerals, plus related items. This is sure to become your favorite stop if you are a crystal lover, a collector or a holistic practitioner. Stocked with exquisite stones, the shop specializes in high vibration, radiant crystals and minerals from all over the planet. Open Tuesday-Saturday 10 a.m.-6 p.m., Sunday 11 a.m.-4 p.m. Independent and locally-owned Farmhouse Flowers specializes in floral arrangements, but they alsocarry plants, primitive home décor, gifts and candles. Hours: Tuesday-Friday 9 a.m.-5 p.m., Saturday and Monday open by chance. Hannaford started out as a fresh produce vendor in Portland in 1883. They are committed to carrying local products made or grown in the states they do business in, and they’re bringing in more local products every year. Open Sunday-Thursday 7 a.m.-9 p.m., Friday and Saturday 7 a.m.-11 p.m. for Westbrook and Gorham stores; Monday-Saturday 7 a.m.-10 p.m., Sunday 7 a.m.-9 p.m. for the Buxton store. Your neighborhood Shaw’s delivers a convenient and friendly grocery experience. From their bakery and deli, to fresh produce and helpful pharmacy staff, they’ve got you covered. See how you can place your order online and get your groceries delivered straight to your door at shaws.com. Store hours: 7 a.m.-11 p.m., daily. Carter’s Green Market is a specialty retail store including, but not limited to, craft brews and artisan wines, gourmet foods, housewares, limited grocery, plus a large selection of gluten-free and organic foods. The freezer has several options for dinner including lasagna, salmon and turkey pies. Their Grab’n Go menu offers a variety of sandwiches, soups and salads. Business hours are Tuesday-Friday 10 a.m.-6 p.m., Saturday 10 a.m.-3 p.m. 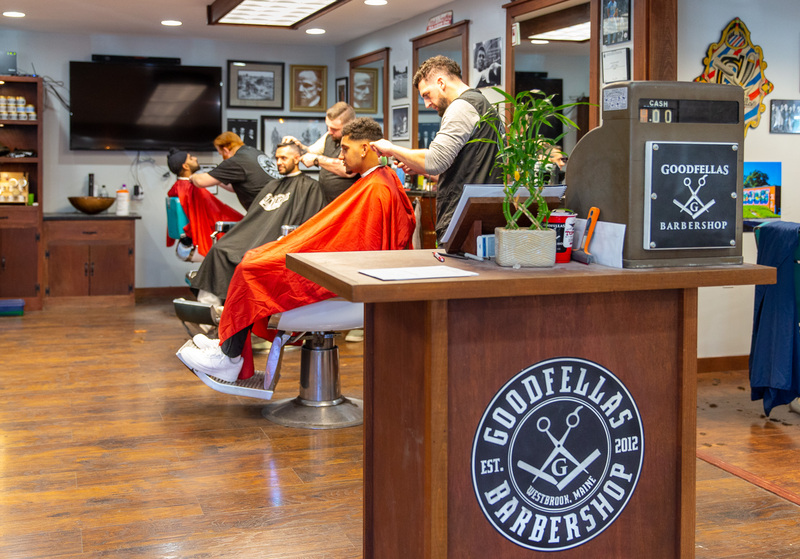 Established in 2012 by owners Jeff Carroll and Chad Gervais, Goodfellas Barbershop fuses old-fashioned style with a postmodern edge offering haircuts for all ages. Their four barbers perform gentlemen cuts to fades and tapers. They are a walk-ins only establishment – no appointments. Open Tuesday-Friday 10 a.m.-5:30 p.m., Saturday 7-noon. Adalia Salon consists of a creative team of hairstylists who have a passion for color – luscious blondes, rich brunettes, vibrant red, Celtic auburn, and beach highlights. There’s an experienced professional nail artist on board, too. Specialties include makeovers, coloring, cuts, styling, feathers, up-dos, manicures and waxing. Hours are Monday-Friday 9 a.m.-5 p.m., Saturday by appointment. Family-owned and -operated, the services at Top Cuts Barber Shop consist of standard hair cuts, flat tops, fades, skin fades, scissor cuts, high and tights, sports cuts, beard trimming, etc. They offer walk-in service only. Open Monday-Friday 7:30-5 p.m., Saturday 7:30 a.m.-noon. Sportsman’s True Value and Just Ask Rental offers a full line of lawn and garden supplies, Pratt & Lambert paints, automotive supplies, plumbing, electrical and hardware. They have a large selection of equipment rental ranging from heavy power equipment to garden rototillers. They provide a variety of services, including small engine service and K1 heater repair. Online shopping is available with free shipping to the store at sportsmanshardware.com. Plummer’s Ace Hardware is the local hardware store for all your home-improvement and hardware supplies. They offer a selection of interior and exterior paints, plumbing, heating and electrical supplies. You will also find hardware, lawn and garden products and an assortment of hand tools, batteries and flashlights, tarps, wire fencing, cement products and more. They are a propane fill-up station. A sampling of the store services at Aubuchon Hardware include shade cutting, rental equipment including log splitters and wood chippers, key cutting, screen repair, custom tinted paint and propane tank fill-ups. Some of their products are Agway Feeds, barbecue grills, Benjamin Moore paint, Blue Seal pet food, bulk bark mulch, farm and garden supplies, maple sugaring supplies, pellet stoves and wood pellets. They are your turkey frying headquarters. 1 Dodge Oil & Propane Co.
For more than 60 years, the people at Dodge Oil & Propane have prided themselves in providing topnotch heating service and fuel deliveries to families and businesses throughout the Greater Portland area. Their goods and services consist of propane gas, heating oil, K-1 kerosene, 24-hour heating service and delivery, heating system installation and design, bio fuel, as well as payment and price protection plans. Go to dodgeoil.com for more information. The primary service at Holly’s is heating oil delivery. Orders may be delivered the same day, next day or next available day when the driver is in your area. Please note that same-day delivery is not guaranteed. They offer an automatic fill-up option. Check the list of towns and cities in their delivery area at hollysoil.com. Office hours are Monday-Friday 7 a.m.-3 p.m. Established in 2001, Dave’s Oil is a #2 fuel oil delivery service. The company has a 100-gallon minimum delivery requirement. Family-owned and -operated since 1913, Hub Furniture Company has been one of the leading home furnishings centers in northern New England. An experienced sales staff, free delivery and special credit terms complement their wide selection of furniture for every room in your house – priced direct from the warehouse to you. See hubfurnitureco.com for salesroom hours. Established in 2007, Premier Rental is a locally-owned and -operated rental purchase store. They rent to own and sell home furnishings, appliances, electronics, computers and more. There is no credit needed to do business with them, and everyone is already pre-approved. They offer flexible and predictable payment options. When you rent, Premier takes care of service, set-up and delivery free of charge. For more details, go to westbrookpremier.com. Beals Ice Cream begins with their own formula and the finest ingredients and then they handcraft small batches of more than 100 different recipes to bring you a super-premium product that is creamy, delicious and unique. You will find flavors like teaberry, German fudge cake and salted caramel right alongside of the ever popular coffee Oreo, cookies and cream, plus coconut almond bar. Read descriptions of their creations at bealsicecream.com. Dairy Queen restaurants are still, and always have been, the place to find kids’ sports teams celebrating a victory and families taking time out to enjoy great food and soft serve treats. Savor their treats visually at dairyqueen.com. Open Sunday-Thursday 10:30 a.m.-9 p.m., Friday and Saturday 10:30 a.m.-9:30 p.m.
On any given day, Smiling Hill Farm offers more than 20 flavors of ice cream at their dairy store. They churn out old favorites like French vanilla and unique varieties like ginger, apple pie and grapenut. The Dairy Store serves up ice cream cones, sundaes, frappes and floats year round, every day from 10 a.m.-6 p.m. They sell quarts of ice cream, too. The Pratt Insurance Agency, established in 1982, is a family-owned and -operated firm of proven professionals. They carry personal insurance products to protect your assets including auto, homeowners, umbrellas; business insurance; and financial security and services, such as investments and pension plans. Read more at prattagency.com. Office hours are Monday-Friday 8:30 a.m.-4:30 p.m.
Chris Doughty is a second-generation State Farm agent. He can provide you and your family with quality auto insurance, and protect your home and family with the security of homeowner’s insurance. His mission is to help people manage the risks of everyday life, recover from the unexpected and realize their dreams. Business hours: Monday-Thursday 9 a.m.-5 p.m., Friday 9 a.m.-4:30 p.m., and Saturday by appointment only. The agents at Chalmers Gorham provide quality insurance products and financial security to their community-based neighbors with personal and friendly service. They are focused on protecting your assets and review a broad range of coverage options to find the right insurance policy for you. Chalmers has long relationships with multiple carrier partners to provide competitive coverage options. See chalmersinsurancegroup.com. Since they opened in 1999, Casa Novello has been serving delectable Italian cuisine to families in the Westbrook area. The restaurant is a cozy neighborhood fixture serving up thick-crust pizza, as well as pastas and other Italian mainstays. Their dishes are wholesome, filling and prepared with fresh and local ingredients. Open Monday-Thursday 4-8:30 p.m., Friday and Saturday 4-9:30 p.m., Sunday 3-8:30 p.m.
Gorham House of Pizza is a family restaurant where Angelo and crew welcome the opportunity to serve you and make you feel like part of their family. They use only the freshest ingredients in all of their dishes, and their pizza dough is made fresh every day on site. Catering is available. View their menu at ghop.me. Hours are Sunday-Thursday 11 a.m.-11 p.m., Friday and Saturday 11 a.m.-midnight. A staple of Main Street, Profenno’s Pizzeria & Pub is a family-owned restaurant serving pizza and pub fare including sandwiches, seafood, steak and home-style meals. The pizzeria is known for their freshly baked bread and specialty pizza. There’s a full-service bar with live music every night Wednesday through Saturday and an open mic night on Sundays. For hours and menu, see profennos.com. Providing quality pet care since 1987, Refreshing Paws offers boarding, where their heated and air-conditioned dog kennels consist of large indoor runs with cement walls between the dogs for a less stressful visit. Additionally, the facility offers group doggie day care, where your dog can expect a day rich with exercise and attention. Their grooming services run the gamut from a simple nail trim to the complete works. See refreshingpawsmaine.com. Bethany Jones, owner of Just Fur Friends, has been grooming dogs for more than 25 years and her experience with all breeds of dogs has grown exponentially. Anna Devoe, manager, started working at the shop in 2013 as a bather and worked into an apprenticeship. They show patience and a gentle touch with dogs of all ages, as well as timid or nervous dogs. The duration and price of a grooming session varies, dependent on breed, hair type and style requested. The owner of Pet-i-cure has 15 years of experience with the grooming of dogs and cats. Prices vary on size, condition of coat, and other factors. She performs brush outs and clipping, bathing, nail trims, and equine clipping. The shop is open Monday-Thursday, by appointment only, starting at 7:30 a.m. Whether it’s lawn mowing, seasonal clean ups, snow removal, mulching, dump runs or other landscaping projects, the crew at Knight Property Services is confident their services will leave you satisfied. They offer year-round property maintenance contracts for both commercial and residential properties. They can do it all, from caring for your lawn in summer to plowing your driveway or parking lot in winter and everything in between. See kpsmaine.com. Derek Corbett of Corbett’s Lawn Care provides complete lawn care services such as mowing, edging, mulching and plant installations. Call now if you need a fall cleanup. He also does driveway seal coating and junk removal. Free estimates are given upon request. See samples of his work on the company’s Facebook page. Brookscapes Property Services has been servicing the Greater Portland community since 2005. Owner Ben Cutter and his qualified staff bring more than 27 years of landscaping experience to your project. Their seasonal property maintenance includes such services as weeding, pruning, leaf removal, de-thatching lawns, parking lot sweeping, snowplowing and shoveling. Andrew Broaddus is a general practice attorney who received his law degree from the University of Maine School of Law in 1980. 2 Desmond & Rand, P.A. Desmond & Rand, P.A. is a full-service firm specializing in areas of law including wills and trusts, landlord and tenant, plus business and auto accident. They offer a free initial consultation for those with cases involving auto accidents, personal injury, social security disability and workers compensation. Their standard business hours are Monday-Thursday 8 a.m.-5 p.m., and Friday 8 a.m.-4 p.m., although they also have flexible appointment availability. 3 Sawyer, Sawyer & Minott, P.A. Established in 1992, Sawyer, Sawyer & Minott, P.A. is a general practice firm established in 1992 with offices in both Windham and Gorham. Lawrence R. Sawyer, John W. Sawyer and Laurence P. Minott Jr., attorneys with extensive prior experience as sole practitioners, joined forces in order to offer their combined knowledge, expertise and legal skills to those needing legal services. At Lavish Earth Holistic Center, Jillian Smith LMT offers customized therapeutic massage therapy. A session with Smith may include deep tissue technique, Swedish massage, myofascial release, relaxation and stress relief massage, reflexology, aromatherapy or Reiki. She offers meaningful relief from pain and deep relaxation in a peaceful setting. The passion at Skin & Body of Gorham is relaxing and repairing your body through therapeutic massage. Their licensed massage therapists offer everyone the opportunity to receive the care they need on any budget. They are committed to optimizing your well-being and health. Hours are by appointment only: Tuesday-Thursday 9 a.m.-6 p.m., Friday 9 a.m.-3 p.m. and Saturday 10 a.m.-1 p.m.
Erin Webber at Gorham Massage & Wellness has been an LMT for 12 years. She practices many modalities including Swedish, deep tissue, Asiatsu, Thai yoga and hot stone. Gift certificates are available. A state-of-the-art 1,000-seat theater and event center, the Westbrook Performing Arts Center is funded entirely by the citizens and businesses of Westbrook. The center presents a variety of different events including music, dance theater, comedy, movies, business meetings and many school and community functions. For a schedule of upcoming events, go to westbrookpac.org. Lenny’s at Hawkes Plaza is a gastro pub serving sensibly sourced, home-style Maine food alongside some of Maine’s best roots music performers in a handcrafted, cozy room. The combination creates one of southern Maine’s most unique dining and entertainment experiences. Check out their menus at lennyspub.com. Open Tuesday-Saturday 3:30-10 p.m., Sunday 3-8 p.m.
Professionally trained and licensed, every member of TNT Nails team is an expert in the latest nail-artistry techniques and products. They use only high-end, name-brand products and have hundreds of colors to choose from. Give yourself a little guilty pleasure by indulging yourself in their whirlpool spa chair that provides a full body massage. Check their list of services at tntnailswestbrook.com. A full nail care salon, Art’s Nails specializes in spa pedicures, shellac manicures, acrylics, pink and whites, art designs and waxing. They are known for their fabulous massages complimentary with every nail service. Gift certificates are available. Call to make an appointment or just walk in. Business hours are Monday-Friday 9 a.m.-7:30 p.m., Saturday 9 a.m.-6:30 p.m. and Sunday 10 a.m.-4:30 p.m. Euphoria Nail & Spa is a full-service nail salon that has been serving the community since 2009. They have a wide selection of services ranging from manicure and pedicure to waxing, all in an elegant, yet comfortable, atmosphere for both men and women. Their talented staff is experienced and stays current on all the latest nail and beauty trends. Open Monday-Saturday 9:30 a.m.-7:30 p.m., Sunday 11 a.m.-5 p.m. The Animal Refuge League of Greater Portland provides temporary care and shelter for stray, abandoned, confiscated and relinquished animals, and places as many pets as possible into responsible and caring homes. They create awareness and support for the humane treatment of all animals and strive to end animal overpopulation through education and the promotion of spaying and neutering. Learn how to adopt or foster a pet at arlgp.org. The charitable giving made by the Warren Memorial Foundation is restricted to programs in education and the arts, primarily for cultural and children’s programs and secondary education. Founded in 1990, Saco River Theatre enriches the community as a performing arts center and public forum for accessible and diverse cultural and educational programs. Through their professional Equity theater, music venue, cross-disciplinary arts lab and exhibition space, they celebrate creativity and plant the seeds of shared experience. Visit sacorivertheatre.org. Formerly an industrial site, the Westbrook River Walk is a remarkable transformation from the city’s industrial roots to a charming escape from the bustling urban landscape along the shores of the Presumpscot River near downtown Westbrook. The walk provides a short hike on multi-surfaced terrain. Leashed pets are allowed. In the winter, Smiling Hill Farm operates an extensive cross-country skiing operation. They offer approximately 25 kilometers of machine-groomed trails around the picturesque and historic farm. Trails are groomed wide to allow both classical tracks and a generous skate lane. A fully equipped ski package rental line is available. Open every day conditions allow from 9 a.m.-5 p.m.
Sunset Ridge Golf Links provides numerous activities and event space for the community. Their 9-hole regulation golf course, 9-hole foot golf course and driving range provide their customers with a wonderful day in the outdoors. Their expansive indoor and outdoor space allows Sunset Ridge to accommodate large community events. Read much more at sunsetridgeme.com. Guided by the expertise of several area holistic veterinarians, The Animal House is the destination for all cat and dog needs. Within their store you will find a large variety of all-natural pet foods, supplements, collars and leads, toys, supplies and unique goods. They carry scores of food brands. Read more at theanimalhouse.net. Store hours are Monday-Saturday 10 a.m.-8 p.m., Sunday 10 a.m.-5 p.m. The Dehler Animal Clinic is a full-service facility providing health care for companion and working animals, plus house calls and farm calls for horses and farm animals. Together with his staff, Dr. Dehler is committed to providing animals and their families with high quality care and services. Clinic hours are Monday-Friday, 8 a.m.-6 p.m., Saturday 7:30 a.m.-1:30 p.m.
Long Horn Horse & Pet Supply carries a wide variety of products for your horses, pets, poultry and wild birds, under one roof, all at everyday low prices. They’re one of Poulin Grain’s largest dealers. Read about their delivery service and more at longhorn.me. Store hours are Monday-Friday 8 a.m.-6 p.m., Saturday 8 a.m.-4 p.m., and Sunday 9 a.m.-1 p.m. Filling more than one billion prescriptions each year, CVS/pharmacy is one of the nation’s leading retail pharmacies. From their mobile app to their pharmacy team, they provide the tools and expertise you need to manage your prescriptions. See their weekly flier, ExtraCare savings and sales on their items – all in one place at cvs.com. Pharmacy hours are Monday-Friday 8 a.m.-8 p.m., Saturday 9 a.m.-6 p.m., and Sunday 10 a.m.-6 p.m.
Hannaford Pharmacy is a convenient, affordable solution to maintain good health for your entire family, including your pets. There, you can get patient-friendly care at budget-friendly prices Refill ordering is convenient by refilling your prescriptions 24 hours a day online or by phone. Pharmacy hours are Monday-Friday 8 a.m.-8 p.m., Saturday 8 a.m.-6 p.m., and Sunday 8 a.m.-5 p.m.
At Rite Aid, the staff provides you with the support, products, pharmacy services, and the wellness+ with Plenti savings opportunities you need to keep your whole family healthy. Sign in for “Refills Made Easy” and get reminders and order refills for prescriptions via text. Most Medicare Part D plans are accepted, some with co-pays as low as $0. The pharmacy is open Monday-Friday 8 a.m.-8 p.m., Saturday 9 a.m.-6 p.m., and Sunday 9 a.m.-5 p.m. The mission of Village Physical Therapy is to assist patients by providing optimal physical therapy services and to promote wellness through patient education. In order to match care to each individual’s needs, they provide a hands-on approach, using a variety of manual therapy techniques as well as exercises and activities drawn from several disciplines. Learn how their therapists can get you back on track at villageptme.com. Hours are by appointment only. Riverview Physical Therapy is an outpatient orthopedic and sport medicine physical therapy clinic. Their first priority is the patient, and they provide personalized treatment with hands-on, compassionate care. Some of the services offered are orthopedic care, injury assessment, athletic training outreach, work rehabilitation, carpal tunnel syndrome/sprains, strains and fractures. They accept most insurance, including Medicare and worker’s comp. Back in Motion Physical Therapy features a team of licensed, experienced physical therapists committed to state-of-the-art care and dedicated to your success. Their staff has more than seven decades of combined experience to draw from to help make sure you get increased function and effective pain relief. They have a wide range of advanced rehabilitation equipment. Open Monday-Friday 7 a.m.-7 p.m.
Gorham House of Pizza is a family restaurant that uses only the freshest ingredients in all of their dishes, and their pizza dough is made fresh every day on site. All pizzas are available in white or wheat crusts with a choice of two sizes: 10-inch and 16-inch. View their menu at ghop.me. Open Sunday-Thursday 11 a.m.-11 p.m., Friday and Saturday 11 a.m.-midnight. Maine’s first name in pizza, Angelone’s began on Portland’s Veranda Street back in 1947. Their Westbrook location opened in 1971 and is a family-owned and -operated business. Their pizzas come in three sizes – 9-inch, 12-inch and 15-inch. Cash only. Open Monday-Saturday 11 a.m.-8 p.m.
Westbrook House of Pizza serves up homemade pizzas, pastas, salads, grinders and sauces. They make their dough fresh daily, and their sauces are homemade. They are a family-owned business with 60 years of experience in the pizza business. Eat in or take home their fresh homemade meals. They now offer delivery. Open daily, 11 a.m.-9:30 p.m.
Pine State Services is your green source for energy efficient plumbing, heating and cooling. Their trained technicians and licensed plumbers are ready to handle all your commercial and residential plumbing needs. They also offer A/C service, refrigeration, solar, radiant, design/build, sewer and drain, bathroom remodeling, well pumps, gas service, and more. They have teams of emergency technicians available around the clock. See pinestateservices.com. Some of the heating products and services provided by B&D Burner Services include triple-pass, high-efficiency green boilers, steam-forced hot water, warm air units, mobile home furnaces, annual cleanings, tune-ups, oil tanks (inside and outside), heat zones, black iron pipe work, monitor heating and duct work. Fecteau’s Heating works directly with all of the major providers in the furnace industry and is licensed in master oil, propane, natural gas, heat pumps and air conditioning. There are many choices available to their clients in heating options. Considerations range from efficiency, preference, price and reliability. Their team will work closely with you to ensure you make the best possible choice for your home or business. They offer 24-hour emergency service. Whether you are new to the market or an experienced investor, Willis Real Estate has the expertise, proven track record and resources to help you achieve your real estate goals. With an extensive knowledge of the area, they can help you find the right home for you or the right buyer for your home. For a one-stop real estate website for your home buying and selling needs in Gorham and the Greater Portland area, go to paulandjanwillis.com. With more than 20 years of experience, North Point Realty began with a singular vision: to create an independent and locally owned brokerage firm that raises the expectations of the consumers in the Greater Portland marketplace. They believe you should expect more from your real estate experience. Meet their brokers at northpointrealty.me. Po-Go Realty has been serving Gorham and adjacent areas since 1970. The agency has buyer specialists, experience in short sales and foreclosures, and brokers that also specialize in mobile homes, new construction, condos, land, senior communities and commercial buildings. Their integrated network of computer and communication systems grants access to the Multiple Listing Service, public record searches, the internet, plus other tools and services. Visit pogorealty.com. MK Kitchen brings elegant ambience with rustic tones, making this a place for everyone to feel welcomed, whether it’s a night out with friends or a special occasion. The food, wine, décor and service have all been carefully contemplated. Chef Mitch and his team make the menu items from scratch including the soups, sauces, ravioli, gnocchi, focaccia bread, gelato, desserts and more. Reserve a table online at mkkitchen.net. Whether you’re coming in for drinks or a three-course meal, you’re always welcome at the Frog & Turtle. They now serve mimosa flights at brunch and feature live music every Wednesday and Friday with no cover. See their extensive wine list at thefrogandturtle.com. Open Tuesday-Thursday 4 -9 p.m., Friday and Saturday 4-11 p.m., Sunday brunch 9 a.m.-1 p.m. The bar opens at 4 p.m., and the kitchen serves from 5-9 p.m. Ever since Casa Novello opened in 1999, they have been serving the area with great Italian food. Their dishes are wholesome, filling and made with fresh and local ingredients. Enjoy a romantic candlelit dinner for two or bring the whole family. The staff guarantees a dining experience you’ll love for a lifetime. They have off-street parking, take reservations for lunch and dinner, and provide catering services. In 1902, Amato’s Real Italian Sandwich was born. That’s when a young Italian immigrant named Giovanni Amato first took his small cart down to the fishing docks of Portland and began selling freshly baked rolls filled with meats, cheeses and fresh vegetables to the locals. Along with their original Italians, other sandwiches fall into the categories of focaccia, hot, grilled paninis and fresh wraps. Custom-crafted juicy, fresh, flavorful burgers on grilled buns are the specialty of the house at Blazes Burgers, but their menu abounds with other offerings, too. Chicken sandwiches, BLTs, grilled cheese, hotdogs and lots more are on the menu. Accentuate your sandwich with a choice of sides and dipping sauces. Gluten-free sandwich rolls are available. Open Tuesday-Sunday 11 a.m.-8 p.m. Founded in 1965, Subway is the world’s largest restaurant chain, with more than 41,000 locations, offering a wide array of better-for-you sandwiches and salads. They care about their food and are moving toward no preservatives, no artificial flavors, and no colors from artificial sources. They work with growers to bring you the best possible produce. 12 Elm St., Gorham, 222-0004. A specialty retail store, Carter’s Green Market offers craft brews, artisan wines, gourmet foods, housewares and limited grocery. Their freezer is stocked with great options for dinner including lasagna, salmon and turkey pies. Immune-boosting elderberry syrup can be found on their shelves just in time for the cold season. There are many local products on hand to prepare your own unique gift basket. Store hours are Tuesday-Friday 10 a.m.-6 p.m., Saturday 10 a.m.-3 p.m.
Whipping up pastries and sandwiches, The Baker’s Bench has been baking from scratch for more than 25 years. Dreaming of one of their legendary cream horns? Customers swoon over them. Other choices, to name a few, are cinnamon rolls, croissants, blueberry scones, and lemon squares. The Rachel, their popular toasted sandwich, consists of turkey, Swiss, homemade cole slaw, and Thousand Island dressing. Open Monday-Friday 7 a.m.-5:30 p.m., Saturday 7 a.m.-4 p.m.
With an Eastern-European influence, Medeo European Food & Deli carries deli meats, cheese, tarragon or pear soda, Russian chocolates and other candies, vegetable and fruit preserves and much more. Business hours are Monday-Friday 9 a.m.-7 p.m., Saturday 9 a.m.-6 p.m.
Gorham House of Pizza is a family restaurant that uses fresh ingredients in all of their dishes, and their pizza dough is made fresh every day on site. University of Southern Maine students get 10 percent off their purchase with a valid USM ID. View their menu at ghop.me. Open Sunday-Thursday 11 a.m.-11 p.m., Friday and Saturday 11 a.m.-midnight. Serving award-winning Chinese cuisine, China Villa Restaurant is a casual eatery providing a range of Szechuan and Cantonese plates. Some popular dishes are chow mein, chicken with broccoli, General Tso’s chicken and lo mein. The dining area seats about 40 people, but many orders are for takeout or delivery. Their hours are Sunday-Thursday 11 a.m.-9 p.m., Friday and Saturday 11 a.m.-10 p.m. Founded in 1974, Edgewood Animal Hospital is a full-service animal hospital providing veterinary care for a variety of companion animals. They offer a full spectrum of animal wellness care, surgeries and diagnostic services, using the latest technology including state-of-the-art digital x-ray imaging. Business hours: Monday-Thursday 8 a.m.-6:30 p.m., Friday 8 a.m.-5 p.m., and Saturday 8 a.m.-noon. Westbrook Animal Hospital is a small veterinary hospital that treats primarily cats and dogs, but also welcomes your rabbits, ferrets, rats and other furry friends. The staff offers a wide range of services from annual exams and surgeries to routine vaccinations, nail trims and dental cleanings. They sell a variety of flea and tick products, as well as prescription diet food. Office hours are Monday- Friday 8 a.m.-5 p.m., Saturday 8 a.m.-noon. Dr. Dehler and his staff provide full-service animal care to dogs and cats, as well as farm animals and equine. You can count on their practice for a variety of primary veterinary services including preventive medicine, spay and neutering, surgery, home visits, backyard farm visits, pet dentistry, radiography, and more. The clinic is open Monday-Friday 8 a.m.-6 p.m., Saturday 7:30 a.m.-1:30 p.m.